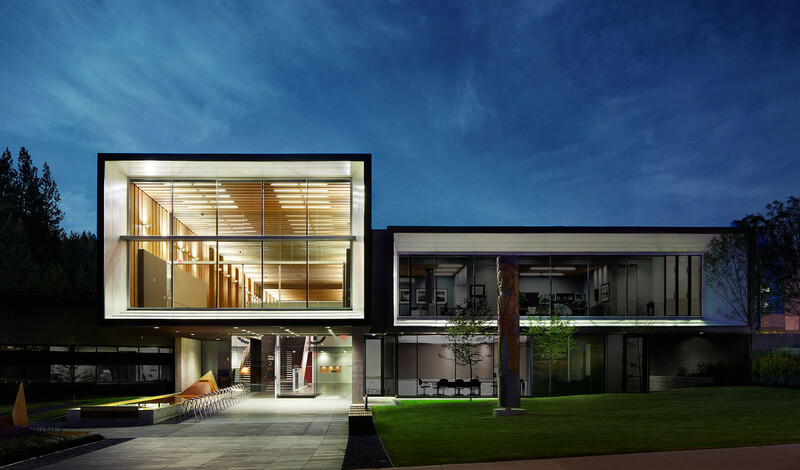 This project expanded the existing North Vancouver City Hall into the vacated library structure and provided a new atrium to bridge between the existing building and renovated office space. The project encompasses 2,700 square meters of renovated space and 1,100 square meters of additional space for a total of 3,800 square meters. The Atrium provides new entrances both on 13th Street and across from the City Library on the 14th Street Plaza and has created a new identity for the City Hall. The design team’s goal was to create a very public building; about the community and for the community. It is a hub of social and business activity. The design is open and transparent. The main link between all departments and the public is found in the 67 metre (220 foot) long atrium space that brings together the community. The design stitches together the remaining elements of the 1974 building with the contemporary addition for an integrated whole. 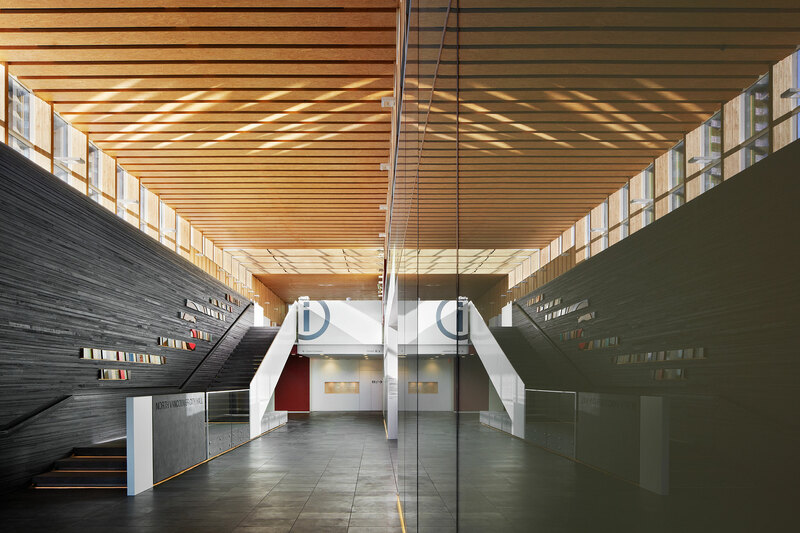 The building celebrates the community of North Vancouver through art, design and the creation of shared informal community space inside and out. The Atrium provides a new and improved space for large public gatherings. Sustainable design objectives were considered for all aspects of the project. These included environmental, social and economic sustainability. The Civic plaza and City Hall is a critical hub for transit and pedestrian networks integrated into the City’s broader ‘Living City’ initiative. 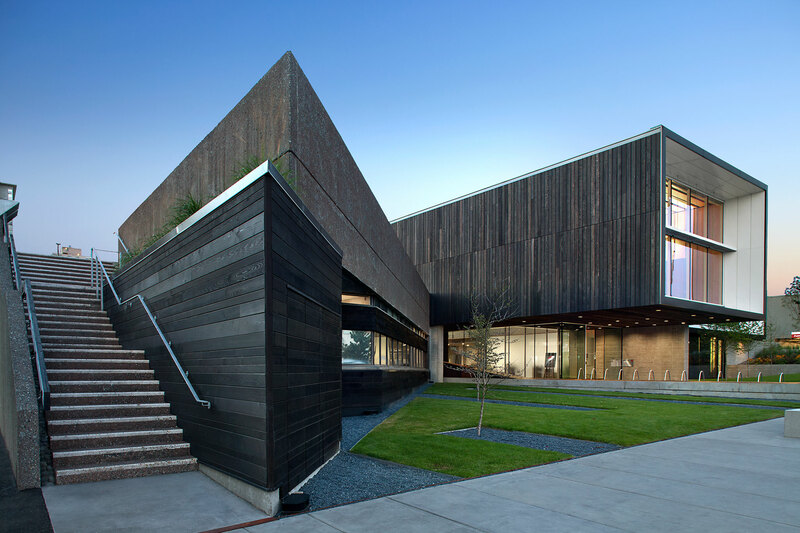 The design builds upon this environmental foundation in all its facets. Within the building itself skylights provide natural light to the deeper portions of the upper level office plan. Additional lightwells below these openings provided lighting to the lower level offices. These skylights also work to provide natural ventilation exhaust for the office spaces. The offices are also open to the public atrium – air is drawn across the office space and vented through high level vents along the atrium. Exterior sunshades prevent solar radiation from reaching south facing rooms during summer months. The upper level roof garden has a series of paper bark maple trees that shade the atriums west facade in summer but let light and warmth through when the leaves fall in winter. A priority of the project was to address long term energy costs. The renovation and addition is integrated into the Lonsdale Energy Corporation, providing radiant heating and cooling to the new slabs in the building. The corporation is a critical local energy plant on the lower level of the City Hall building, integrating several civic buildings and new residential towers to provide and efficient, shared source of energy. The design team also sought to reuse and tell stories of reuse through the design. An 80 year old elm tree sat in the space between the existing library and city hall. The roots of the tree were damaging the two structures and it was determined that the tree must be removed. To honour its loss and mark its presence where the atrium now stands, the design team repurposed the wood in the feature wall of the Atrium staircase. The design also removed cedar sunshades from the existing building. The large timbers removed were milled down for landscape benches giving the wood a new life in the public landscape. 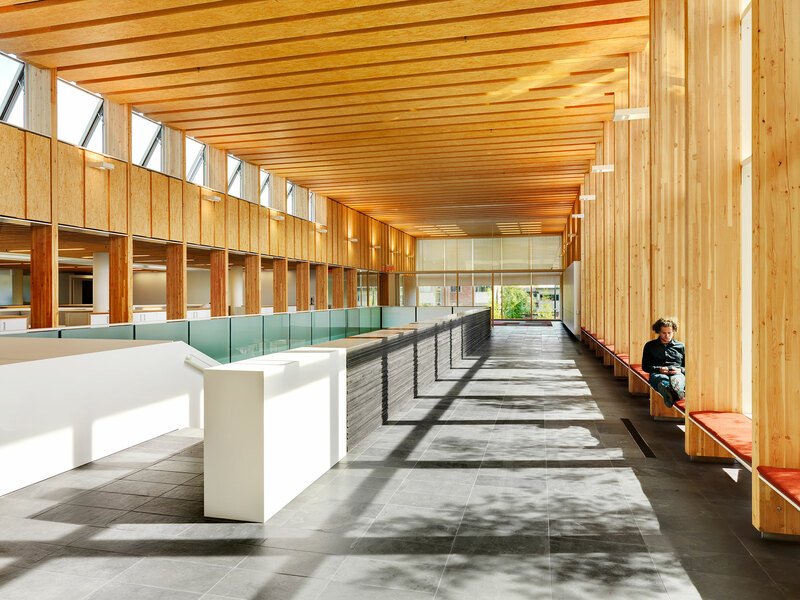 The innovative, mass timber atrium roof structure, is built of cross laminations of large format Laminated Strand Lumber (LSL) panels; a first of its kind solution spanning 32’ and interlocking to make a 220’ long atrium. 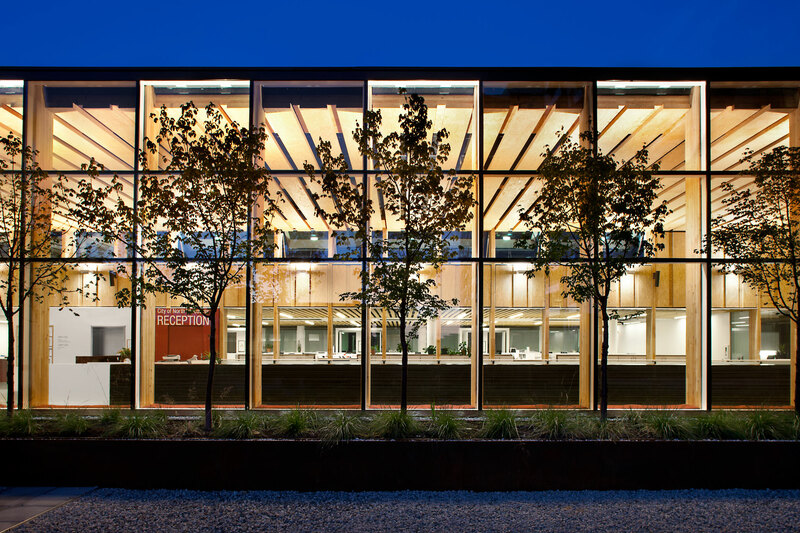 Although typically relegated to small scale hidden conditions in light wood frame construction, LSL panels for City Hall were pre- fabricated, erected on site and left exposed as the main interior finish; a strong example of how mass timber structures can offer low energy, rapidly renewable and carbon sequestering structural solutions in an elegant honest design.